I was born on 8 August 1949 at Kingston Hospital in Surrey. My parents were Mary Clarke and Thomas Harry Clarke, and we lived at 258 Kings Road, Kingston upon Thames, Surrey. I have two sisters, one sister, Maureen, and the other Bernadette. Maureen is my older sister; she is seven years older than me. Bernadette is my younger sister, and she is two years younger than me. We were well cared for. We have a lot to be grateful for. As a child, I was very religious, and I was a devout Catholic. The reason for this that when my parents married they had to agree to bring their children up as Catholics. My mother was an Irish Catholic, and my father was a Protestant, and the church would not allow the marriage to take place unless they guaranteed that the children would have a good Catholic education and upbringing. I believe that my father promised to become a Catholic at some point in his life. As a child I was very curious about religion. I believe this was because I was brought up as a ‘super Catholic’ according to the promise that my mother had made to the church. The lives of ordinary Catholics, was dominated by the church. Every Catholic was expected to attend Mass and every Catholic was expected to go to Holy Communion. Catholic children had separate religious services in school, and we were not encouraged to mix with non-Catholic children in a social environment. I was always curious about religion, and I was always keen to ask the questions that other children had not thought about or were afraid to ask. The nuns and priests saw themselves as the guardians of the teachings of the Church. They interpreted the meaning of the Bible, and they were the intercessors between man and God. Consequently, they saw no reason to teach theology. Apart from strict doctrine, and they did not allow any freethinking on religious subjects. The Pope and the church were deemed infallible, and this infallibility was passed down to the bishops and the local priests. So much so that they had a tight hold on their local communities when the local parish priest came to visit you sometimes even the Bishop, it was as if the Queen was coming to tea. The best crockery and cutlery was laid out, and deepest respect was paid to these holy people. As I explained before, I had a very strong religious faith and upbringing and this prevented me from indulging in the same sort of activities that were common to my peers. By this I mean that there was always something holding me back from taking part in normal teenage activities and indulging in things, which I thought, were not proper or not correct. I came to these conclusions because of my strong religious beliefs, and also the moral teachings imparted by the Catholic Church. I did go out on occasions to teenage clubs and dancing and I did some things that a normal teenager might do without exceeding the limits. I was still very curious about religion, and when I was younger I had visited a Baptist church, because I had some Baptist friends and it was completely different to what I had experienced in the Catholic Church. My mother was very upset that I had gone to a Baptist Church, and I told her I wanted to go there to find out what it was like and why they were different from us and why we were not allowed to visit other people’s churches. She said that we are Catholics, and I said well, they are Christians as well, and she said, I do not know about that but I do know that we are Catholics. Therefore I got the impression that we were forbidden to mix with people of other faiths. This just increased my curiosity, and I began to explore the theology behind Catholicism and Christianity generally. I had always had my doubts from when I was a young child, as I explained earlier, but I was increasingly aware that I did not believe that Jesus was God. and I did not believe a just and merciful God could have allowed him to die on the cross. Even when I was very young I asked the nuns and priests to whom Jesus was praying to in the garden of Gethsemane? Why was he asking God to save him, if he was God himself? They could not or would not answer the question and told me that I need not ask such questions. That just made me even more doubtful. I left school with a minimum amount of qualifications, and I got a job in a factory; because my friend worked in the same factory and thought it would be good for us to both work together. I did not really receive any guidance from my parents about what kind of job to apply for and so it just happened that I found this job in a factory with my friend. It was mainly production work, inspection and packing. In 1966 or 1967 Mr. Kaleem Malik and Mrs. Rana Malik, an Ahmadi husband and wife, started work at the factory. At lunchtime, Mr. Malik used to come to the packing department, where I worked and have lunch with his wife. I became very friendly with them, because I was always interested in history, and particularly the history of the British Raj. And so we discussed history, geography, politics, Pakistan and many other subjects. Finally, we talked about religion, and they began to tell me a bit about Islam. I told them about my doubts about Christianity, about my Catholic upbringing and about the fact that I did not believe that Jesus was God. I was amazed when these people who had come from the other side of the world, starting to tell me about their belief in Jesus or Hazrat Isa may peace be upon him as they called him. They said that Jesus may peace be upon him was a human being and he was also a prophet of God. That he was definitely not God Himself, and they also did not believe that Jesus may peace be upon him died on the cross. I was completely stunned by this! How could these people who had come from the other side of the world, believe the same things that I did? I knew nothing about Islam, and yet here my views were being reflected back at me as if I was looking into a mirror. This came as a great shock and also a wonderful surprise to me. Naturally, we talked more and more about Islam and about their beliefs and soon I realised that I had come across something very important and that I was following the path to truth. After a while, they invited me to their house for a meal, which I gladly accepted. They had three children; Nadeem, Tahseen and Zareen and lived in a house in South Wimbledon. In 1968, I was invited to go to Eid at Wandsworth Town Hall. It was a very happy occasion for me, although I did feel a bit lost and self-conscious. Mr Malik who held my finger led me through the crowd like a little child. People were very friendly and welcoming, even though I was mistaken for being a member of the press rather than a guest. Imam Bashir Ahmed Rafiq gave the Eid sermon and he told the story about how Ishmael was going to be sacrificed by his father Abraham. I had not heard this version before, because the Bible taught that it was Isaac, who was going to be sacrificed. I was sitting next to Mr. Matiullah Dard who passed me a little note asking me for my name and what I was doing there. I replied that my name is Michael Clarke and that I was ‘A trainee Ahmadi’, he still has that little note today. I was introduced to several members of the Jama’at, and I was greatly impressed by their friendliness towards me and they were curious to know who I was. As far as I remember we went back to the Malik’s house afterward and we had a very nice Eid meal. In the same year, 1968, the Third Khalifa gave his important address, ‘A Message of Peace and a Word of Warning’ at Wandsworth Town Hall. I was privileged to meet him later at the London Mosque. His bright pink shiny face overwhelmed me and this luminous milky glow that seemed to come from his face into the air around him. I can only describe it as a spiritual experience and I was convinced that this man was different to any other man that I had ever met. I could tell that he was a very special person and true spiritual leader. This increased my desire to know more about the Ahmadi community and I asked the Malik family many questions and had many meetings with the Imam, Maulana Bashir Ahmad Rafiq and the then deputy Imam, Maulana Ataul Mujeeb Rashid. Over the course of several meetings I had asked some very difficult questions about Islam and Ahmadiyyat. I made my questions difficult because I really wanted to find out the answers. Thank God they are able to answer all my questions. There were still one or two areas of doubt, because I was still learning, but even these questions were answered. The more I prayed and the more I studied, I became more and more convinced of the truth of Ahmadiyyat. I attended more functions for young men at the London Mosque. I can remember when the place seemed so big and it was easy to get lost in all the rooms of Mahmood Hall. I was reading everything I could about Islam and I borrowed many books from different friends; and I am grateful to them, because those books increased my knowledge and understanding. I was in a difficult position as an English teenager, I felt that I had one leg on one continent and the other leg on another continent and I was split between the two. The way of life of a Muslim and a way of life of a normal English teenager are so different. The transition was harder for me back then, because the ways were so different, it was hard for me to adapt. My mother, bless her, could not understand why I wanted my eggs fried separately in margarine and why I was I wearing a funny little cap and bobbing up and down on the carpet. I explained to her about my new found faith. She never said it, but I feel she was disappointed, because she had promised to bring me up as a good Catholic. I told her that she had fulfilled her promise and had done her duty, but perhaps God had decided another path for me. She had met Mr and Mrs Malik and she liked them and she could see that they were having a good influence on me. 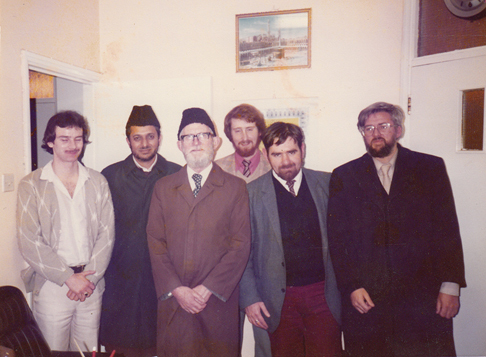 Left to right: Tahir Selby, Imam Sahib, Maulana Bashir Orchard, Luqman Whittenger, Muzzafar Clarke and Nasir Ward. I began to change my life and my outlook. I began to question my actions and I decided that some of the things that I enjoyed doing were worth giving up for something better; and so my life changed. I did lose friends, but I gained more new friends in my new community. We did some quite exciting things, I remember organising a Tabligh meeting with placards and banners in Trafalgar Square (which is something we would not do these days), and in other events including Study Circles at the mosque. I met many other new young friends and those people are still friends even though most of them are now fathers and even grandfathers. Many are senior members of the Jama’at today, but we were all young men then and we enjoyed the excitement of activities together. I met another English Ahmadi, Rafiq Mahmood, so there were now two of us. I took part in a sports day, just outside Kingston in Roehampton. By coincidence, I met Naseem Ahmed Bajwa when we were travelling to the sports day. He was a new missionary in this country and we struck up a conversation and a friendship. I came to know Mr. Bajwa very well over the forthcoming years. After awhile, I left my job at the factory and under the influence of Mr and Mrs Malik, I started an A-level course in Kingston. I finished my A-levels, but because of a family tragedy, I did not get the results that I had hoped for. A lecturer at the college was Mrs Edwina Currie, who was my economic history lecturer, and she suggested that because I wanted to be a social worker, there were more opportunities for trainee social workers in Birmingham than there were in Kingston; because Birmingham is a large city. This was true and I thought that it was time to leave home anyway and that a new start in Birmingham would be a good move. I moved to Birmingham in 1974. I got my job as a trainee social worker, and I stayed in small flats and rooms. I did not have any contact with the Jama’at. May be it was accidental, I do not know, but I do not think anyone knew I was there and I did not really know anyone in Birmingham at all. As time went on, I began to still maintain my religious beliefs and one or two friends and my social activities, reflected this to some extent. I was doing the normal activities of a young male in a strange city, but I kept my Islamic beliefs to myself. I moved around from place to place and eventually moved into a room in Selly Oak in Birmingham and one night, two men came knocking on the door and said that they were from the Ahmadi community. I was a bit shocked and embarrassed and I did not know what to say because they had appeared ‘out of the blue’. They were Chaudhry Abdul Hafeez and his son Baseer Rehan and they wanted me to go with them to their home to have a meal. I was surprised by their visit and I needed time to think, therefore I made an excuse that I had to go somewhere else. I had to explain to my landlord who these men were and I explained my link to them and about my religious beliefs. This was a turning point for me and my religious life began to re-emerge once again. I felt emptiness inside like a black hole; there was something missing. I joined an historical re-enactment society to help fill the hole and I took part in many English Civil War battles as a Parliamentarian Pikeman. It was good fun, but it was not enough. The black hole needed to be filled by something more. The year was 1983 and I was a clerk at the Industrial Tribunal’s Office in Birmingham. One of my colleagues was a very devout Christian lady and she believed in evolution. As stated in the Bible, the world was created in six days and God rested on the seventh. We would often spend our tea breaks discussing religious matters and this subject came up. It awakened in me a strong desire to address the subject from a logical and Islamic viewpoint. She was greatly surprised to find out that I was a Muslim and I told her the Qur’an teaches that evolution was planned by God, but it happened over a period of time and that Adam and Eve were not the first human beings as taught in the Bible. She could not accept this as a Christian and a believer in the Bible, but she could see that I was interested in religious matters. I had worked with this lady for a few years and we were friends, therefore she invited me to her house for dinner, which I accepted. After a while, she suggested that I might like to see a service at her Baptist church and then have a meal with her and her husband. I agreed and we went to the church service and felt that the church service had been arranged beforehand, partly for my benefit, because the vicar gave a sermon about accepting Jesus Christ as their saviour. He asked if there was anyone in the room that wished to give their life to Jesus. At this point, the whole congregation turned around and looked at me and expected me to say something, I did not. I believe her intention was sincere, that she had assumed that I could not refuse to become a Christian, and she said, I will pray for you that you will learn the truth and will become a Christian. I replied that, I hope and pray that you will see the truth of Islam. I think it was about a week after that, that I met my friends in the Historical Re-enactment Society and I attended a wedding of one of my friends. It seemed to me that he did not really wish to get married, but he was being pushed into it by his future wife. They had all of the ceremonial things at the church including a horse and carriage, wedding suits and a beautiful church to have the wedding in, but somehow it seemed to lack a spiritual aspect. I had attended a celebration party with the groom the night before the wedding and it seemed rather pointless, because it concentrated on having a good time, but seemed to be an occasion for regret, rather than happiness. This seemed to me to be a worthless exercise and it made me feel rather depressed and I wondered what the purpose of such a life was and whether or not people could ever really be happy. I was living alone at that time and I came home depressed and went to bed early. The light was on in the room and I was lying on the bed. I fell asleep and had a strange dream. I saw that I was sleeping on the bed and that my body rose off the bed. I was looking down and I could still see myself on the bed, but separate from my body. I floated out of the room and then I floated into the church where I had been previously and when I looked down I could see everything in the church including the lady’s head, she had bright ginger hair, and it looked like a red circle from the up above. I was still suspended above the scene and I floated out of the church and back into the room where my body lay. I was able to look down at my body on the bed and somehow I re-entered my body as it lay on the bed. After this I awoke and was looking up at the ceiling, towards the electric light bulb. The filament inside the light bulb seemed to be spelling out a name and the name it was spelling out was Allah. At that point, I felt compelled to get off the bed and to get down on my knees and pray. I did this. I knelt by the side of the bed and I prayed as hard as I could for Allah to send me an angel. I kept repeating it over and over again, send me an angel to give me some comfort and I prayed and prayed to Allah asking forgiveness for my sins and said I was ready to accept the truth and to turn to Him and that He had shown me the way that I was ready to commit myself to Him and to become a proper Ahmadi Muslim. I prayed like this constantly over and over again, I do not know how long it might be in minutes or it might have been hours. I felt a physical presence in the far corner of the room. Light came from the corner of the room and it gradually spread. I put my hands up to my face and I could see the light reflecting on my palms. I could see this with my eyes and it was happening in front of me. This was not a dream. Then the whole room was bathed in light and at some point I felt heaviness on my shoulder, it felt like someone had placed a hand on me, a comforting hand. And then I felt a shockwave go through me right through my head to my feet. I felt relieved and knew that everything was going to be all right and that something, an angel or something else, actually touched me and made physical contact with me. After this a wave of emotion swept over me. I felt tired and exhausted and I lay down on the bed and slept the most peaceful sleep I had ever slept in the whole of my life. The next morning I went to work and I told this lady, my colleague of the dream that I had and she turned to me and she said, that it was not God, but it was Satan trying to influence me and I said, we will see and I know that that is not true. The dream seemed to tell me that Islam is superior to Christianity and that was why I floated above it. And then another miracle happened. The very same morning I received a telephone call at work from the missionary at the Ahmadiyya Mission House in Washwood Heath, Birmingham. The Missionary was Maulana Mirza Naseer Ahmad who informed me that he had received a message to contact me. I had never met him or had any contact with the Mission House and yet on the very day that I had my spiritual experience, I do not call it a dream, because I know it was more than that, I received a call from him, which seems to prove that he was the angel that I had asked for. It was a miraculous proof to this Christian lady of the power of prayer, but she could not believe it. She still insisted that it must be Satan. She was obviously proved wrong. On this very day I went to the Mission House and met Maulana Mirza Naseer Ahmad and I introduced myself. I told him what had happened and he said it was surely guidance from Allah. We became good friends and we still are. I am very grateful to him. The following weekend I went to visit the Malik family and we went the London Mosque to sign the Bai’at Form. I have always considered myself to be an Ahmadi from the time I was 17 years of age, but at that time, nobody had asked me to sign the Bai’at Form and even though I signed it several years later, I still consider myself to be an Ahmadi from those early days. I immediately felt a sense of happiness and fulfilment and I knew that I had come home again to my faith and that I was ready to practice it. In 1983 shortly after my Bai’at, I was given the honour of attending the International Shura in Rabwah, as a UK Delegate. 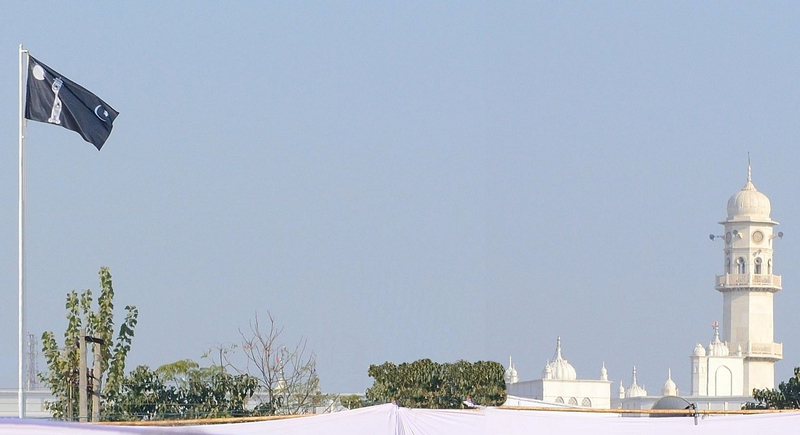 I also made a speech at the Jalsa in Qadian and attended the last Jalsa Salana at Rabwah. I was fortunate to have a private and very affectionate meeting with Hazrat Khalifatul Masih Rabi (r.h.). Huzoor very kindly gave me his pen as a gift. In 1990 I attended an International Conference in Moscow and delivered a speech to delegates entitled ‘Islam and East/West Communications’. I presented a copy of the Holy Quran in Russian language to the Head of Vatican Radio, who presented it to the Vatican Library. I played an active part in the Birmingham community and joined various committees and carried out different activities. I was elected as the Birmingham Khuddam-ul-Ahmadiyya Qaid, for two years and during that time we had the honour of guarding of Huzoor’s residence during the Jalsa. We did it so well that we were asked to perform the same duty in subsequent years. I was then appointed Regional Amir for the Midlands, which I served approximately 2 years. I have given speeches at the Jalsa Salana, appeared on Question and Answer sessions on MTA, I have worked very closely with Hazrat Mirza Tahir Ahmad on the English rendering of certain verses of the Holy Quran. I carried out this work with Maulana Naseem Qamar Sahib over a period of eighteen months. I also proof read and made suggestions for two of Huzoor’s books. Since then I have taken part in various activities and programmes for Birmingham East, Central and West Jama’ats. May Allah enable me to continue to serve the Jama’at in every way possible. Ameen. 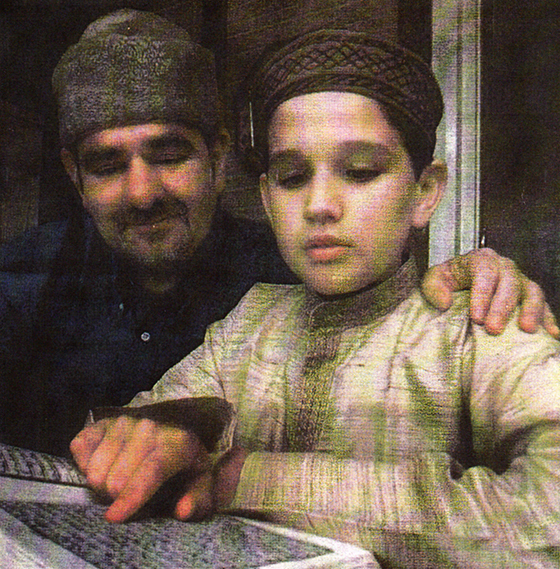 Mr Muzaffar Clarke overlooks his son Mansoor Clarke of Birmingham Jama’at reading the Holy Qur’an. – This was the front page cover of an article in the Evening Mail on 16th October 2001. Muzaffar’s son Mansoor has just completed Jamia Ahmadiyya and will serve the Jama’at as a Missionary. Mansoor was also the presenter on the MTA International programme ‘Beacon of Truth’.